Much of what went on in the past is not acceptable today!...crossing the line? We went to the cathedral last week. 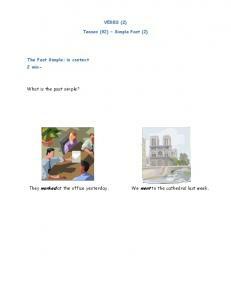 VERBS (2) Tenses (02) Simple Past (2) The Past Simple: in context 2 min- What is the past simple? What was the Museum of Technology in the past? What is 5:35pm in the 24 hour clock? What is equal to half past 9? Sampling and Aliasing: An Interactive and On-Line Virtual Experiment What we see is not what it is! What Is the Significance of the Trinity? What is the nature of the market? Much of what went on in the past is not acceptable today! ...crossing the line? An NHO guide for companies’ work policies and practices with regard to gifts, entertainment and various expenses for people who are not company employees. How can the company guide its employees? Communicating the guidelines is crucial Consider organisational procedures How do we change practice? Responsible practice - a managerial responsibility As a member of the board, it is your responsibility to see that company management does what is necessary to ensure a good corporate culture. There are many reasons why these issues should be addressed now. • New legislation (2003) on corruption and trading in inﬂuence has come into force. As a business leader, you are responsible for what happens in the company. It is easier to bear this responsibility if you can depend on your colleagues to act honestly, ethically and within the bounds of the law. Creating a culture of correct behaviour is therefore an important managerial duty. It is by your own behaviour as a manager that you set the standard. • Attitudes and practices with regard to gifts and entertainment are changing. Many people need to re-examine their own practices. • Journalists, politicians and others in the media pay close attention to cases of bribery. • What type of corporate culture do we want? • What sort of behaviour can damage or enhance the company’s reputation? • Which grey areas should we avoid in order not to risk breaching the law? Developing relationships Good relations between clients and suppliers are important for the smooth running of business. Nevertheless, it is important to understand how to form relationships. In this booklet we will look at what is acceptable to give or receive in terms of: • Gifts, i.e. goods, services etc. given to acknowledge a good relationship or as positive feedback. • Hospitality, i.e. entertainment, activities and invitations/tickets to events to initiate or develop a business relationship. • Various expenses, i.e. payment of expenses for a prospective client or business partner when it is not a part of the agreement. As part of this responsibility, the company management must consider: • What sort of behaviour is ethically justiﬁable? The working group has provided their recommendations to the best of their ability, but it must be emphasised that discretion may be needed when dealing with these issues. The forms provided in the booklet give examples of assessments. The assessments are based on legal and ethical matters as well as reputation. Variations can arise depending on your line of business and country, and the assessment must be based on the actual situation in which you ﬁnd yourself. Individual companies must carry out such assessments themselves and guide their employees accordingly. In addition, the company code of practice must take into account legal considerations pertaining to tax, employment contracts, competition and other legal situations. Companies rely on good relationships Companies have to win their customers over. Customers must choose to buy the company’s products. Suppliers, authorities and other parties inﬂuence the success of the company in the market place. • What is happening with others operating in the market place? How do we ﬁnd out about new developments that are important for our business? Delivering a product at the right price, at the right time and of good quality is rarely enough. There are usually others who can deliver an equivalent product. You must make the customer aware of what you can offer. • Why should the customer choose your product? • How are you going to explain what distinguishes your product? • What could a business relationship with your company imply in terms of expertise and follow-up service? Networking is important as a means of exchanging information that can later lead to concrete co-operation. Good networking stems from both a business and a personal foundation. Marketing and sales promotion is important. The company must build up relationships with clients, suppliers, authorities etc. Identity, loyalty, trust and expectation must be developed. • Many products require special relationships. Some products are developed in cooperation between the customer and the supplier. Others require ﬂexibility in production and supply, and the conﬁdence that solutions can be found. • Not all products ﬁt in a seller’s briefcase. Some of them require you to travel to view them. Some of them require you to spend time on them. • Repeated dealings with suppliers or subcontractors who you know are serious and good ensure quality and keep costs low. • International relationships can be demanding. You may have different views on many things. You should know one another well enough to be able to discuss things along the way. In many cultures, personal trust is more important than what is actually written in the contract. • Remember that it is important to understand those you are working with and their values before you start working with them. Developing a business is about being able to see the possibilities Not all contact between companies involves the buying and selling of an actual product. Relationships can often be beneﬁcial in the long-term and often in areas that you had not foreseen at the beginning of the relationship. Those who make strategic decisions regarding the further development of the company must know the opportunities the company has: • What will be the future requirements of the customers? • Who has the expertise we require, but which is not available in our own company? What kind of co-operation is necessary to make the best use of this? There are boundaries that must not be crossed A variety of methods can be used in marketing and in inﬂuencing people. There are many areas where networks can be developed. Nevertheless, there are many boundaries that must not be crossed. This applies in particular with regard to giving something extra to someone who is about to make a decision. In the worst case scenario, this involves corruption. There are grey areas between corruption on the one hand and legitimate marketing and inﬂuencing others on the other. The boundaries are often unclear. Even though a process is not illegal, it may not be acceptable from an ethical or reputable point of view. Media, professional and trade bodies have their own views on what constitutes good ethics. Some methods are clearly illegal. In other cases it may be unclear whether something is legal or illegal, but the action may in any case be ethically unacceptable. It is also possible that behaviour that is clearly lawful can be perceived to be ethically dubious. It is important for the reputation of a company that the formation of company relationships occurs in a legal and ethically responsible manner. Companies that have come under the media spotlight, have often been criticised more because of public ethical concerns than because of breaking formal laws. Even so, a simple transgression can destroy the trust of others and cause lasting damage to the company’s reputation. If doubt arises about the company’s ethical practice, it is very difﬁcult to restore conﬁdence. The individual company must therefore draw up boundaries for the methods they will use in forming working relationships. This is about guidelines and also about shaping attitudes. It is not possible to create a set of rules that can advise on handling every situation that could possibly arise. • Also include beneﬁts given to (or received from) someone abroad • Include not only beneﬁts to the person who will be making the decision but to others who can inﬂuence the person concerned Anyone working in a job, assignment or duty, in Norway or abroad, will be charged with corruption under § 276a if that person a) gives or offers someone an improper advantage or b) demands for oneself or others or receives or accepts an offer of an improper advantage. These actions are punishable under § 276c if they occur in order to inﬂuence the carrying out of a job, assignment or task. Corruption and inﬂuencing trade is punished through ﬁnes or prison sentences of up to 3 years. Large-scale corruption is punishable with prison sentences of up to 10 years. Any such involvement is treated in the same way. Both the company and the individual may be prosecuted. The regulations may rely on a person’s judgement and may therefore be difﬁcult to interpret precisely until a legal precedent has been established. Remember that both tax legislation and competition law may have relevant clauses. “improper advantage” • An advantage has an economic value or other useful value (for example membership of an exclusive club, sexual favours, access to information that is normally difﬁcult to obtain). • Improper: behaviour that is obviously reprehensible - may depend on, amongst other things, the economic value of the advantage, customs and internal guidelines. • Gifts given just before a decision is to be made are more likely to be considered improper. The same applies if the recipient is a public employee and especially if the person concerned is a purchaser or an inspector. CONSIDER that… • The recipients may also have their own internal guidelines—study them so that you avoid embarrassing others • Public employees are as a rule bound by strict guidelines as to what they can receive. Avoid situations that can create misunderstandings. • Some payments are taxable for the recipients. Is there any point in receiving a gift that you have to pay for yourself? • Improper advantages given to family members or to others close to the public decision-makers often in roles such as “advisers” or “organisers”. The company abroad - foreign legislation It can be difﬁcult to know what is perceived as improper in other cultures. How should the trafﬁc light forms be used? a) The need to employ various middlemen. b) A demand for “facilitation payments”—money to carry out something that you have a right to have carried out without an additional payment. The problem with the ﬁrst in particular is that different types of relationship-building and inﬂuencing trade can be done in the name of or interest of the company, which the company does not have control over. With the new Norwegian penalty clauses, you may have a signiﬁcant responsibility for the corrupt actions of middlemen. Situations that should be avoided because they are obviously illegal or because there is a strong possibility that they may be illegal. Legal and ethical in most cases. Is something expected in return? Could we have given or received a gift of the same value? What is the purpose of the gift? Are you about to make an offer or are you about to enter into negotiations? Is it a personal gift or is it for the company? Is it of a signiﬁcant or insigniﬁcant value? What ethical guidelines are the recipients bound by? Are the recipients public or private employees? Is the gift given openly or in an underhand way? Is it delivered to your house or to the workplace? Is the gift for lots of people or just one person? How often? Facilitation payments are punishable under Norwegian corruption legislation unless such payments are characterised by coercion or blackmail. Such payments can also be punishable in the country in which you are operating. Companies must work systematically to counter such payments and to desist from making such payments unless doing so could result in a danger to life, health or a signiﬁcant loss of large sums of money. If such payments occur, you must not attempt to conceal them in the accounts. Most countries have statutory provisions regarding corruption. In OECD countries these are quite similar to the Norwegian laws. The Norwegian regulations don’t make any distinction between whether the bribes are connected to people working in or on Norwegian or foreign jobs or assignments. Foreign laws can apply in addition to the Norwegian ones but not instead of them. This also applies when the transaction is carried out by a Norwegian or a Norwegian company abroad. When sponsorship is requested as a concession in relation to a business transaction, there are grounds for being cautious. Is this a clever way to use one’s position to obtain ﬁnancing for one’s leisure pursuits? There is nothing good about corruption. It makes carrying out business more difﬁcult, increases costs and creates impediments in production and delivery. A society that is plagued by extensive corruption is hampered in its economic and political development. Most people view support from companies for sports clubs, cultural institutions and voluntary organisations as something positive. This is acceptable as a means of increasing one’s proﬁle or as an attempt to motivate people. Unfortunately this can also sometimes be a way of inﬂuencing someone through the use of personal advantages. Therefore, be open about such support and show the same caution with regard to personal ties as it is normal to do with regard gifts and entertainment. THINK about your company’s practice today… • The forms in this booklet give examples of how many companies consider these issues • The blank forms at the back of the booklet can be used to discuss the attitudes of the company, in administration and management, as well as in the individual workplace. How can the company guide its employees? Why must a company advise its employees in relation to gifts, entertainment and the payment of various expenses? • The media and pressure groups, as well as administrative bodies, ask which ethical guidelines companies are following. Changes in legislation and society’s expectations and practices in business have made many people unsure of what is acceptable. • Clients and suppliers ask for information about your guidelines. • Companies have a responsibility to ensure that their employees have sufﬁcient information to ensure that they don’t fall foul of the law. • The guidelines can help to ensure that you are operating within the law. • Employees request advice and guidance with regard to the laws and ethical guidelines that are applicable. In particular think about: What is the purpose of the invitation? Are you about to make an offer or are you about to enter into negotiations? Is the invitation for one person or the company? Have you discussed who should go? Is something expected in return? Is it of a signiﬁcant or insigniﬁcant value? Could we have given or accepted a similar invitation? What ethical guidelines are the recipients bound by? Are the recipients public or private employees? Are several people or just one person invited? How often? Who pays for travel and accommodation expenses? Is the professional content of adequate quality and relevance? How can the company guide its employees? • Ethical guidelines (code of conduct) is a good way of spelling out and making known what types of practice the company will be renowned for. The work of drawing up the guidelines will in itself be an important instrument in the development of the company’s ethics and culture. It is not therefore a given that the company has to change its values or ethical guidelines in this area. Perhaps the most important effect of this work will be to give co-workers conﬁdence in the company’s values, giving them the protection they need to make decisions that they think are right in a difﬁcult situation. • An open culture for the discussion of ethical questions is necessary in developing a good understanding with regard to how guidelines are practised. Each employee should be able to discuss such issues with their line manager, and colleagues should be able to harmonise their assessments with each other. • Leading by example is very important in this area. There may be a good reason why the managers have greater freedom than others with regards to business-related social events and some employees are more vulnerable to unwarranted pressure. Nevertheless, a manager cannot expect any other behaviour than that which he himself stands for. • Deﬁnite action is important in relation to inﬂuencing conduct. Emphasise and reward good examples of correct decisions that have been taken, especially where this has come at a price. Do not tolerate dubious shortcuts even if they have helped achieve a goal. Important assessments to make when you are setting out guidelines for gifts, entertainment and various expenses • General, discretionary rules or more detailed regulations? General regulations may be easier to draw up, more ﬂexible with regard to different situations and possibly more durable over time. However, they give less concrete answers to employees who are unsure as to where they stand on the matter. Detailed and concrete regulations can on the other hand make people less aware of issues that are not being dealt with clearly. Will there be limitations on the amounts? What do we do with gifts that we receive? • Who approves this when there is doubt? - How far down the line do you go? - Will personnel who are particularly competent be involved in the decision? • Will employees be instructed to report dubious behaviour that they come across which involves other employees? • Will we continue to give and receive personal gifts to and from the company? Someone makes it known that it is unwanted. Others make it known that they are rafﬂing off gifts. Others perceive the giving of gifts to be a nice custom. • What will you do to ensure that the guidelines are adhered to and what will you do if the guidelines are breached? “My company’s too small for me to have time to concern myself with something like this” • The challenges are the same. You must consider the demands that the law and peoples’ expectations of your ethics, place on you. • Smaller can be simpler: when the manager and the employees have close personal contact, it can be easier to pass on attitudes without having extensive guidelines. Involve the employees in the process • The participants in the process look after the result. In particular involve employees who have daily personal experience with the issues and know what is required. Find out what the employees consider to be problematic • Document the problems the employees have in relation to beneﬁts that they are offered from others and where they themselves can have difﬁculties in drawing up boundaries. This can actually be done anonymously. Consider whether other closely related issues should be included or used as a basis for the work • Regarding many of these ethical issues, there are for example general ethical issues relating to personal and professional integrity. • How do our co-workers feel about this? Do the employees feel that their conscience is compromised by any of this? In particular think about: Why should we pay for or have these expenses paid for? Is this clearly business-related? Are the expenses relevant, and can they be veriﬁed? Can the company, as far as possible, handle payment instead of advance payments? Is the payment for the expenses agreed by the company and not just with the person receiving it? Are you about to make an offer or are you about to enter into negotiations? Is it of a signiﬁcant or insigniﬁcant value? What ethical guidelines are the recipients bound by? Are the recipients public or private employees? • Are separate and more specialised guidelines needed? For example, purchasers, controllers and others who are particularly vulnerable or shown a lot of trust, may face special challenges and problems. Special attention should be paid to employees who are working abroad or who have little contact with the rest of the business.. Communicating the guidelines is crucial The introduction of and following up of the guidelines is at least as important as the guidelines themselves. A silent distribution of a new governing document has a rather limited effect. • Joint meetings and more personal occasions ought to be used to introduce and clarify them and to involve people. Credible involvement from the CEO is very important. • You must also communicate your guidelines externally. Clients and suppliers should be aware of your guidelines in order to avoid misunderstandings. You should also familiarise yourself with the guidelines of your important clients and suppliers. Consider organisational procedures • When you cease to follow up the guidelines there is a strong possibility that your employees will also cease to follow them. Among the measures you can use are: training programmes, opportunities to report and alert, a duty to report, advisory roles, audit and evaluation schemes and individual assessment procedures. How do we change practice? What we are used to creates expectations. It can be difﬁcult to change practice without causing reactions from our associates. Some consideration is important in such cases. • Explain that this is a new practice that applies to all relationships (e.g. a letter to everyone who usually gives and receives Christmas presents). • Explain in a nice way why you are doing it—emphasise that you are still interested in maintaining cordial relationships but within a different framework. • With regard to international relations it can be a good idea to explain that this is in accordance with a new development in Norway (e.g. that the NHO has called for a review in this area). • If it is relevant, reference can be made to the new legislation. Copies of the forms The forms on the following pages can be used in the company’s work relating to these issues, both to create general awareness of the subject and to develop your own guidelines in relation to gifts, entertainment and the payment of expenses for others. In particular think about: What is the purpose of the gift? Are you about to make an offer or are you about to enter into negotiations? Is it a personal gift or is it for the company? Is something expected in return? Is it of a signiﬁcant or insigniﬁcant value? Could we have given or received a gift of the same value? What ethical guidelines are the recipients bound by? Are the recipients public or private employees? Is the gift given openly or in an underhand way? Is it delivered to your house or to the workplace? Is the gift for lots of people or just one person? How often? Use these forms to create awareness and when working on guidelines in your company. Cut out the examples from the boxes on the left. Discuss where to put them and then paste them to the form. Put in your own examples if you wish. Enlarge the form if it is to be used with groups. In particular think about: What is the purpose of the invitation? Are you about to make an offer or are you about to enter into negotiations? Is the invitation for one person or the company? Have you discussed who should go? Is something expected in return? Is it of a signiﬁcant or insigniﬁcant value? Could we have given or accepted a similar invitation? What ethical guidelines are the recipients bound by? Are the recipients public or private employees? Are several people or just one person invited? How often? Who pays for travel and accommodation expenses? Is the professional content of adequate quality and relevance? Are you being openly invited? In particular think about: Why should we pay for or have these expenses paid for? Is this clearly business-related? Are the expenses relevant, and can they be veriﬁed? Can the company, as far as possible, handle payment instead of advance payments? Is payment for the expenses agreed with the company and not just with the person receiving it? Are you about to make an offer or are you about to enter into negotiations? Is it of a signiﬁcant or insigniﬁcant value? What ethical guidelines are the recipients bound by? Are the recipients public or private employees? Report "Much of what went on in the past is not acceptable today!...crossing the line?"